For surefire tips to manifest a healthy, happy, peaceful and successful lifestyle, here's my interview on This Week in America—Create Your Best Life in 2019. 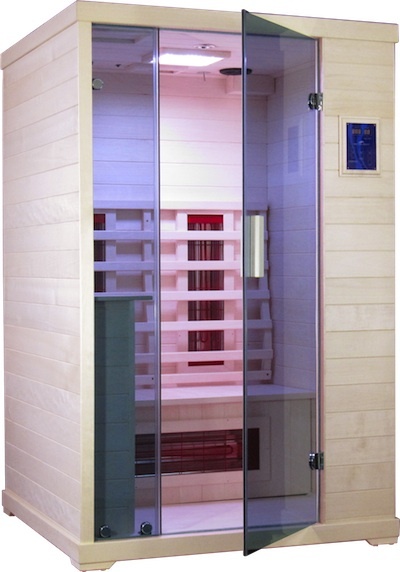 Use my name (SSJ) as a code and get a $500 discount on a Transcend Infrared Sauna pictured here. Vibrant health is a choice away! Emery will gladly answer your product questions and help with your personal health concerns or issues. This is the sauna I have in my home and office and wouldn't be without it. Also, ask her about their Ionizer Plus Alkaline Water device and the Molecular Hydrogen Inhaler & Tablets, too. These 4 products are front and center in my healthy living program and I'm never be without them! For more detailed info on the 10 Benefits of Infrared Sauna Therapy and how it fosters whole-body healing and nurtures vitality, please click HERE. My time in the sauna is a sacred time for me and I enjoy every second in the welcoming warmth of the beautiful wood environment knowing I'm taking care of my God-given body. I bring in my alkaline, hydrogen water with lemon slices; I do my deep breathing exercises; I often use this time to pray, meditate and visualize my goals and dreams; I might listen to music or an audio book; and sometimes I nap (lie down in my larger infrared sauna). How's that for enjoyable multitasking? I know many people who set their saunas up in their home so they can see and hear their television while sitting in the sauna. Others use their sauna-time to return calls or go/shop online, or sing, or visit with a family member who is enjoying the sauna, too. Families who sauna together, stay together. I even have a friend to knits while she sits in the sauna. So it's up to you. You can enjoy the peaceful, healing warmth of the salubrious sauna by simply relaxing and doing nothing, or occupy your time with other activities since an infrared sauna doesn't get brutally hot as a traditional, dry sauna does. The gift of health and healing is the best gift you can give yourself and your loved ones. I recommend the Transcend Infrared Saunas by High Tech Health — the only company with patented heaters that mitigate all 3 kinds of EMF (Electric, Magnetic and Radio). These are the best Infrared Saunas in the industry and are my favorites for reducing inflammation, making weight loss easier, assuaging autoimmune-related issues, and so much more! Using their Transcend will raise your health and vitality to another stratosphere. Click HERE to listen to my radio interview on This Week in America on WINTER & COLD WEATHER WELLNESS — which includes how and why taking Infrared Saunas in your personal home sauna will keep you healthy during the cold season and year-round. Both have been front and center in my healthy lifestyle for decades and they keep me healthy, youthful, detoxified, and rejuvenated year-round! My favorite is the Transcend pictured above. The Transcend 2 and 3 models (TR 2 and TR 3) are perfect for home and office. With the larger model, like I have, you can lie down and relax easier, too, and listen to music or audio books (or even take a short nap). To listen to my radio interview on This Week in America, with host Ric Bratton, where we talk in detail about SWEATING YOUR WAY TO VITALITY, please click HERE. For my article on how Infrared Saunas reverse chronic pain, lower blood pressure, flush out toxins, beautify the skin, help with weight loss, and so much more, click HERE. To read another article on HEAT THERAPY & Infrared Sauna, click HERE. Get a $500 discount for a limited time (to get the discount, use my name as the code "SSJ") on a personal infrared sauna for your home or office. A sauna can go on an enclosed deck, or in an exercise room, bedroom, family room, garage, playroom, bathroom, office, or any location where you can find a few extra feet of space. For my article on environmental toxins and chemicals in your home, their sources and harmful effects, and natural detox remedies, click HERE. From the world-famous clinic in Switzerland, The Paracelsus Klinik, to many of the top MDs in anti-aging and progressive medicine in the United States, as well as thousands of general health practitioners, High Tech Health in Boulder, CO has been the home for the infrared sauna company of choice since 1998. In the popular book written by a medical doctor, Detoxify or Die, the author writes that... "the best way to get rid of heavy metals and pesticide residues is by using an Infrared Sauna." That's definitely true. And I would also add that ta king infrared saunas is also the best way to look and feel younger, completely relax, improve circulation and digestion, quell joint and muscular aches and pains, lose weight, reduce cellulite, and beautify skin. You can call for information (the number is below) on their Transcend Infrared Sauna and also their Ionizer Plus Water Electrolyzer. The Transcend® Premium TR2 Far Infrared Sauna (pictured above) is my favorite one from High Tech Health, the one I have in my home and highly recommend to everyone. Whether you put this sauna in your spare bedroom, on your backyard deck, in your garage, bathroom, or basement, in the garden, or even in the corner of your bedroom, regular use will supercharge your healing, health and rejuvenatio n. It's my #1 health secret to never getting sick and always maintaining my youthful vitality, along with the alkaline water from my Ionizer Plus device also from High Tech Health and my Vital Reaction® Molecular Hydrogen Inhaler and Tablets. When taking an Infrared Sauna in my home, I bring in with me a quart of my Ionizer Plus alkaline water to drink in which I've dissolved 2-3 tablets of Molecular Hydrogen. This practices takes whole-body rejuvenation into another stratosphere. When the sauna session is over, I always feel happier, younger, and full of vim and vigor. I want you to feel the same way, too. Before I go into detail on the benefits of infrared saunas, I thought you'd like to know this is my #1 secret to staying healthy and forever youthful. The photo to the left is my favorite Infrared Sauna — the one I have in my home — their top-quality TRANDSCEND TR2. For ages, I have been using the Transcend Far Infrared Sauna on a regular basis and know it's one of the main reasons that I haven't been sick (not even a cold or the flu) in over 30 years and have never taken any prescription medication. I have also seen remarkable benefits in people using this sauna, including help with weight loss; reduction of cellulite; stress relief; toxin removal; cardiovascular support; reduction in achy joints and muscles; enhanced immune health; skin rejuvenation and so much more. For more detailed information on the benefits of taking saunas and why I chose the Transcend sauna for my personal use, please refer to my book CHOOSE TO THRIVE. It will motivate and inspire you to create a strong, fit body; open up to vitality, prosperity, and equanimity; and to live a balanced and soul-satisfying life. Designed in full color with beautiful photographs throughout the pages, it is available in 5 different formats, including a "Special Limited Edition" copy personally autograph to you by yours truly (SSJ). To learn more, please click HERE. Transcend Infrared Saunas (the best in the industry) come in all sizes whether it's for just one person or an entire family. Personally, I got the largest one so I could lie down in it easily like you see the lady doing in the photos below. Sometimes I sit up when taking a sauna, but I usually start the sauna practice with lying down in some fashion. I often listen to music or motivational audio programs, and sometimes I even take a nap. Saunas, in one form or another, have been used across ages and oceans. Cultures around the world have recognized the relaxing benefits of rendered heat within a warm, welcoming space. From the Romans to the Japanese to the Scandinavians, heat therapy has been essential for the body to unwind from the stresses and hardships of daily life. Far infrared is a section of the natural band of light that is not visible to the human eye, but can be felt as heat. Unlike the high heat produced in traditional saunas, far infrared heat is able to [enetrate the body to a depth of 1.5 to 2 inches. This stimulates they body's cellular detoxification process more effectively and at lower temperatures than a traditional sauna. Heat therapy — sweating — is not only an important part of our physical well-being, but in these modern times of water and air-borne pollution, toxic chemicals, heavy metals, and poor dietary and exercise habits, the therapeutic internal cleansing of regular sweating is critical to maintain a healthy body and mind. The infrared sauna is more beneficial over the steam room if weight loss is desired because of the energy expenditure. Compared to the steam room, the sauna places a greater demand on the body in terms of using up calories — therefore assists in fat loss. The heart has to work harder to send more blood to the capillaries under the skin. There energy required for that process is derived from the conversion of fat and carbohydrates to calories. In addition, the sweat glands must work to produce sweat, which also requires energy and more calories. Studies show that a person can burn up to 300 calories during a sauna session, the equivalent of a 2-3 miles jog or an hour of moderate weight training. On the radio show Here's to Your Health with host Dr. Karla Calumet, we discuss How to Use Heat & Sweating as One of Nature's Supreme Remedies. To listen now, click HERE. Having a personal Transcend Infrared Sauna at home (they come in all sizes to fit small or large spaces) is a surefire way to heal the body and create vibrant health. You can use it any time that's convenient for you, and you won't need to sit in the toxic residue from other people in a community sauna such in a gym. When I take a sauna, I relax in the comfort of this healing space and drink alkaline water (to help further the detoxification of my body) from my Ionizer Plus Alkaline Water System. It's truly rejuvenation in a glass of water — the reason I drink at least 8 glasses of this water daily and use it for my cooking and recipes.